Over the last year, Momentive has assessed Techsil in the value they provide to the silicone market, their manufacturer/distributor relationship and business results. 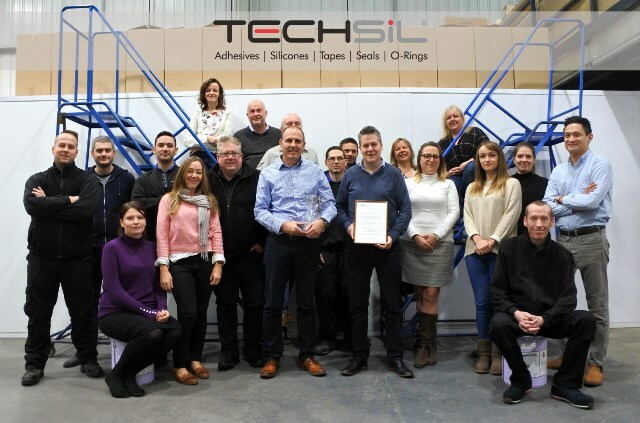 Techsil scored top marks in all seven categories and were the only distributor in the European Electronics Business Unit to achieve the award. With a wide breadth of technical expertise and product knowledge; Techsil is able to offer a problem solving, consultative approach to design engineering. Techsil does not just sell a product, we take an application from start to finish; offering expert advice and support throughout. Our experienced technical sales staff have been working in the adhesive world for many years and we have a team of specialist adhesive engineers, experts in silicone and polymer chemistry, who work closely with our customers to help with their applications. Good communication is vital to running a smooth business and our customer service team always strive to achieve this. They understand end user needs and work closely with our purchasing team to ensure customers’ requirements are translated and met. Thanks to our specialist storage and warehouse facilities, our stock holdings allow us to be very flexible and responsive to short lead-time demands and to reduce the impact of manufacturers MOQ’s on your business. We don’t just focus on in-house communication, the Techsil team communicate effectively across all Momentive business channels to deliver the right solution for customers on a consistent basis. Momentive and Techsil have enjoyed a successful working partnership since Techsil was appointed as a key distributor in 1990. We are delighted to have been officially accredited as a Momentive Performance Materials A1 Distributor and look forward to many more years of this strong alliance.